For my second amplifier project, moving forward from my very successful "Two Stroke" 5F2A build, I wanted something that would be both fun and an even greater learning experience, without costing much out of pocket; I chose to rebuild my Fender Princeton Reverb Reissue (hereby referenced as "PRRI") to authentic 1965 specs, the AA1164 circuit to be precise (named after the month it was created, 11/64). Although the Fender reissues are solid amps in their own right, mine had fallen to 4th place in the arsenal (behind my Echopark Vibramatic 13, Groove Tubes Soul-O 50, and Two-Stroke build), hence, it became expendable for science. I would have settled for some fun modifications, but the PRRI's design is printed circuit board-based, with lots of ribbon connections and board-mounted pots; not fun for experimenting. The main bit of work involved here would be hand-soldering the eyelet board, much more involved than my previous build, and wiring it into the chassis, preserving the amp's transformers, tube sockets, and jacks (pots would need to be replaced). After carefully removing the tubes and then the chassis itself, I measured a slight charge on the electrolytic power supply filter capacitors and discharged them for safety. Then, I started removing the PCB, while preserving as many off-board connections as possible. Next, the PCB strip attached to the the pots came out. I was able to keep the filament heater (6.3v) wiring intact across the preamp tube sockets, as well as the power transformer leads to the GZ34 rectifier tube socket. As for the rest. I left the wires attached to the sockets in hopes of reusing as many lines as possible. In the meantime, I ordered up an AA1164 capacitor kit and eyelet board from Mojotone, as well as an assortment of carbon film resistors and set of appropriate CTS pots from Studio Sound Electronics. Once everything arrived, it took a Sunday afternoon to load up the board, and hot damn do those fat juicy Orange Drop caps look succulent; I could practically hear the difference in tone already. 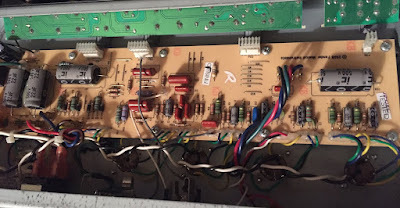 After soldering up the components, I began wiring the board into the chassis, beginning at the input; I was appalled that Fender doesn't use any shielding on it's input wiring, as this is merely an extension of the guitar's cable until it hits that first 12AX7 triode stage. I also attached the input resistor directly to the tube's grid at pin 2, minimizing any chance for signal interference (more on this in a bit). Another Fender gripe: the chassis was drilled for slightly smaller pots, not the standard size of the higher-quality CTS pieces I replaced them with. So, my 9/16" drill bit got a great workout on all six holes. 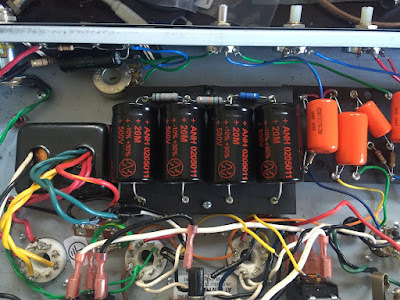 I included a few slight mods at the preamp stage, first lowering the size of the cathode bypass capacitors from 25uf down to 4.7uf, as suggested by friend and amp builder extraordinaire Jamie Simpson of Booya! Amplifier Services. This reduces the amount of low end content in the first two gain stages, tightening things up and eliminating a lot of excess flab at high volumes (Alexander Dumble also does this in many of his preamp designs & mods). Input stage & EQ mods. FYI, the 7025 tube was a military-spec 12AX7 way back. The next mod was done in between those triode stages at the tonestack; a popular one, the addition of a midrange pot, or "raw" control as some call it. The 6.8k resistor going to ground from the bass pot creates a midrange "scoop" that Fender Blackface amps are infamous for, and by adding a 25k or 50k pot before that resistor, you can dial the mids back in for a more tweed-like sound with more gain and thickness than stock (similar to the Vibrato channel of an AB763 Super Reverb). At it's full-on setting, the tonestack is essentially bypassed, and full signal is passing thru from the first triode stage to the second. Alternately, you could simply increase the 6.8k resistor until you find a value that you like, or put it on a switch to toggle back & forth with the original. Whether using a pot or switch, it can be fitted into the "Input 2" jack, or you could drill a hole in the rear panel. Since I've never once used the extra input, it was the most logical spot for mine. I prefer this simple addition to any other sort of gain-staging mods I've heard in the circuit thus far. Remember when I said we'd come back to that input resistor in a bit? Well, it's been a bit. On most dual-input Fender amps, each jack has a 68k resistor wired directly to the tip (hot) connector, then joined together and run to the first preamp tube triode stage. The funny thing is, when you only use one input, those resistors become paralleled, and result in a difference of 34k total resistance on the guitar input, allowing a subtle yet noticeable increase in high end clarity and sparkle. So, since we're losing the 2nd input altogether and only wiring up one, I'm going with a 33k input resistor (something found in some of Dumble's designs as well). The next tweaks are in the reverb and tremolo sections, and include increasing the reverb output resistor from 470k to 1M in order to reduce the overall level returning to the circuit, and two component changes to slow down the speed & increase the depth of the trem; increasing the two ceramic grid resistors from .01uf to .02uf slows it down, and reducing the plate resistor to ground from 1M to 470k adds to the depth of the effect, both aspects I've taken issue with on the PRRI. Now you can get a slow, deep throb that wasn't possible on the PRRI, especially since the Depth control didn't do a whole lot til you got halfway around the dial. After working thru all of this, the next dilemma was at the power supply section; the PRRI integrated it's filter caps into the main PCB, whereas the original AA1164 circuit didn't leave room on the eyelet board for the four large 20uf/500v electrolytics, and instead utilized a "cap can" that attached to the chassis much like a tube socket. I didn't have the tools to punch or drill such a large hole, so i decided to improvise and create a secondary eyelet board for the filter caps. Another thing Jamie Simpson taught me is the importance of grounding the filter caps feeding the preamp tubes closer to that stage of the circuit than the others; in this case, points "A" & "B" on the leftmost caps feed the power tubes, while "D" at the far right feeds the preamp, so I've split off the ground so that the two caps on the right ground near the preamp section. 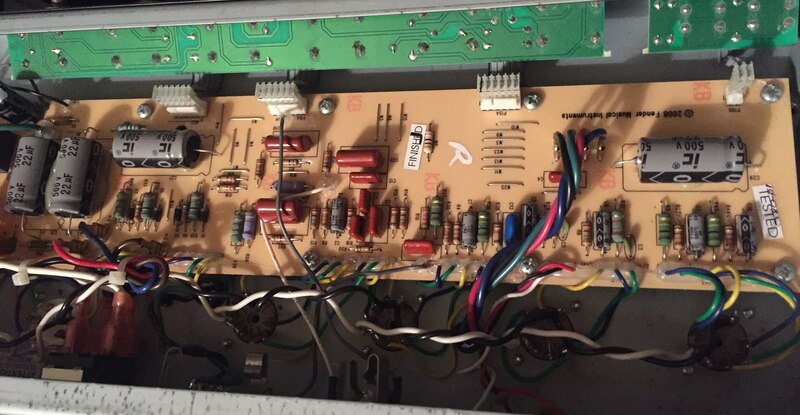 Also, when wiring up the power section, I discovered that Fender had done something odd on the PRRI: the fuse was wired AFTER the power switch, not before it, which goes against any schematic I'm familiar with. If that switch fails or shorts to ground while the amp is plugged in, fireworks could ensue, and not the fun kind. So, I reversed it, with the fuse coming immediately after the AC input on the "Hot" lead, before the power switch. Now it can do it's job and not burn down the house. At this stage in the project, after making all of the necessary wire connections and checking for ground continuity, I decided to fire it up and check my voltages, first without any tubes (but plugged into an 8ohm load, always). Success! My purple pilot light lit up, and heater voltage as present throughout the circuit. Power transformer secondary leads measured 380V AC, a bit more than the 340V called for on the original 1964 Fender schematic (thanks to improved infrastructure over the past 50 years). After this test, I loaded up the tubes, and got some nice soft glow. First power up, pretty lights! I discovered a few things at this juncture: first, the DC voltage coming from pins 2 & 8 of the rectifier tube was reading 525 volts, extremely high compared to the 420V called for in the schematic. Also, there was no bias current whatsoever on pins 5 of the 6V6 power tubes. Turns out I wired the 1N4007 diode backward, a common mistake, but now my voltages were too LOW across the board; I also mistakenly had a 100k resistor in the spot where it should be a 27K, parallel with the capacitor to ground, bleeding off current. After these changes, I finally had negative bias voltage and accurate voltage readings throughout. Just for fun, I tried a few more mods, first removing the negative feedback, which I did not care for... the treble gets a funny paper-y harshness to it, especially when overdriven. Next, I added a 2nd volume (inspired by Dumble), using the extra speaker jack for mounting a mini-1MA pot. Originally tried it just before the 2nd triode of the V3 12AX7; did not care for it at all there, so I moved it to the next stage, just after the .02uf coupling cap and before the phase inverter triode, while also adding an extra .047uf coupling cap (probably too big but all I had on hand)... annnd BINGO. Sounds absolutely fantastic, allowing the first volume to be cranked up for some great overdrive. Without the extra coupling cap after the pot, it was noticeably scratchy when turned; the coupling cap blocks DC voltage from leaking stage to stage in the circuit, while allowing AC (alternating current) to pass, as in the guitar signal. I'll go back and experiment with different cap values in the future. All done, back in the original cabinet with a fresh set of JJ tubes and a Celestion G10 Vintage speaker, ready to be gigged with tonight (I'll have my tweed as a backup, just in case). I might try the same WGS G10C that I've got in my tweed build, but for now, this one sounds pretty good. Also, on my very last power tube bias reading, it landed in 19.65mA, the first year of production for this circuit; I found that to be a pretty damn cool coincidence! The eyelet board is over the chassis? Or is there any gap space for to not touch it with the solder connections? I think that if they are how can not ( all the leads ), the components be liking to ground?